본 발명은 다량의 유기물질을 기화 장치에 제공하고, 기화 장치의 제 1 가열영역에서 상기 유기물질을 기화 온도 미만으로 활성적으로 유지시키는 것을 포함하는, 기판 표면상에 유기물질을 기화시키는 방법에 관한 것이다. How the present invention is to provide a large amount of organic material in the vaporizer, and vaporizing the organic material on a substrate surface which comprises enemy remains active for the organic material to be less than the vaporization temperature in a first heating region in the vaporization apparatus It relates. 본 발명은 또한 기화 장치의 제 2 가열영역을 유기물질의 기화 온도 이상으로 가열하고, 유기물질을 제2 가열 영역에 체류하는 유기물질이 원하는 기화율-의존성 기화온도에서 가열되도록 제어된 속도로 제 1 가열영역에서 제 2 가열영역으로 미터링(metering)하여, 유기물질을 기화시켜 기판 표면상에 박막을 형성하는 것을 포함한다. The present invention also provides a second heating of the heating zone above the vaporization temperature of the organic material, the organic material to stay the organic material to a second heating zone the desired vaporization rate of the vaporization device of claim at a controlled such that heat from the dependent vaporization temperature rate in the first heating zone metering (metering) to the second heating zone by, it includes forming a thin film on a substrate surface to vaporize the organic material. 본 발명은 공급 원료를 일정 온도로 가열하여 기화를 유도하고 증기 플룸(plume)을 생성하여 기판 표면상에 얇은 박막을 형성하는 물리적 증착 분야에 관한 것이다. The present invention relates to the field of physical vapor deposition process which induces vaporized by heating the feedstock at a predetermined temperature to form a thin film on the substrate surface to produce a vapor plume (plume). OLED 장치는 기판, 양전극, 유기 화합물로 이루어진 정공 수송층, 적합한 도펀트를 갖는 유기 발광층, 유기 전자 수송층, 및 음전극을 포함한다. The OLED device includes a hole transport layer, an organic emission layer, an organic electron transport layer, and a negative electrode having a suitable dopant consisting of a substrate, a positive electrode, an organic compound. OLED 장치는 낮은 구동 전압, 고발광, 넓은 시야각 및 평판 발광 장치에 있어서의 전색(full-color) 재현성으로 인해 관심을 끌고 있다. OLED devices are drawing attention because of the full-color (full-color) reproduction in a low driving voltage, high light emission, a wide viewing angle and a flat light-emitting device. 탕(Tang) 등의 미국 특허 제4,769,292호 및 제4,885,211호에는 이러한 다층 OLED 장치가 개시되어 있다. U.S. Patent No. 4,769,292 and No. 4,885,211, such as Tang (Tang) discloses such a multi-layer OLED device. 진공 환경하에서의 물리적 증착이 작은 분자(small molecule) OLED 장치에 사용되는 유기물질 박막을 증착시키는 기본 방식이다. The basic scheme of the physical vapor deposition in a vacuum environment for depositing the thin film of organic material used for the small molecular (small molecule) OLED device. 이러한 방법들은 널리 공지되어 있으며, 예컨대 바(Barr)의 미국 특허 제2,447,789호 및 타나베(Tanabe) 등의 유럽 특허 제0 982 411호에 개시되어 있다. These methods are described extensively and are well known, for example, in U.S. Patent No. 2,447,789 and European Patent No. 0 982 411, such as Tanabe (Tanabe) of the bar (Barr). OLED 장치의 제조에 사용되는 유기물 질은 흔히, 원하는 기화율-의존성 기화 온도 또는 그 근처의 온도에서 장시간 동안 유지되는 경우 분해되기 쉽다. Organic material be used in the manufacture of OLED devices are often desired vaporization rate - liable to be decomposed when held for a long period of time dependent on the gasification temperature, or the temperature near. 민감성 유기물질의 고온 노출은 분자 구조의 변화 및 이와 관련된 물질 성질의 변화를 일으킬 수 있다. High temperature exposure of sensitive organic materials can cause a change in the molecular structure and associated changes in material properties. 이러한 유기물질의 열에 대한 민감성을 극복하기 위해, 소량의 유기물질만이 공급부에서 로딩(loading)되어 가능한한 약하게 열처리된다. To overcome the sensitivity to heat of the organic material, only a small amount of organic matter are loaded (loading) in the supply portion is heat-treated thin as possible. 이러한 방식에서, 유기물질은 상당한 분해가 일어날 수 있는 온도 노출 한계치에 도달하기 전에 소모되어 버린다. In this way, the organic material would have been consumed before reaching the temperature of exposure limits in a significant decomposition can occur. 이러한 실시방식은 가열기 온도에 대한 제한으로 인해 이용가능한 기화율이 매우 낮아지고, 공급부에 재료가 소량으로 존재함에 따라 공급부의 조작 시간이 매우 단축되는 한계를 갖는다. Such an approach has a limit, the operation time of the supply unit is extremely reduced, as is the available vaporization rate is very low due to the limited use of the heater temperature, the material is present in an amount in the supply section. 상기와 같은 낮은 증착율 및 빈번한 공급원 재충전으로 인해 OLED 제조설비의 생산성이 상당히 제한된다. The productivity of the OLED manufacturing facilities is quite limited due to the low deposition rate and frequent source recharging as described above. 이차적으로, 전체 유기물질 충전물을 대략 동일 온도로 가열해 본 결과는, 도펀트의 기화 거동 및 증기압이 호스트 물질에서와 매우 근접한 경우가 아닌 한, 도펀트와 같은 부가 유기물질을 호스트 물질과 혼합하는 것이 불가능하다는 것이다. Secondly, the results of this heated to equalize the total organic material filling substantially the temperature, it is not possible vaporization behavior and vapor pressure of the dopant is mixed with the host material, the addition of organic material, such as a dopant, not very close to the case and on the host material that it is. 상기와 같은 경우는 일반적이지 않은 것이며, 그 결과, 종래의 장치는 종종 호스트와 도펀트 물질을 동시 증착시키기 위한 별도 공급부의 사용을 필요로 한다. Will generally non case as described above, and as a result, conventional devices often require the use of a separate supply for simultaneous deposition of a host and a dopant material. OLED 장치에서 사용되는 유기물질은 공급 온도에 따라 기화율이 매우 비선형적으로 변화한다. The organic materials used in OLED devices is in accordance with vaporization rate is very non-linear variation in the supply temperature. 공급 온도에서의 작은 변화가 매우 큰 기화율 변화를 초래한다. Resulting in a small change in a very big change in vaporization rate of the supply temperature. 그럼에도 불구하고, 종래의 장치들은 기화율을 제어하는 유일한 수단으로서 공급 온도를 이용하고 있다. Nonetheless, conventional devices are used to supply temperature as the only means to control the vaporization rate. 효과적인 온도 제어를 달성하기 위해, 종래의 증착 공급부는 보편적으로 고체 부피가 유기 충전물 부피 보다 훨씬 크고, 절연성이 우수한 고 열전도성 재질의 가열 구조체를 이용하고 있다. In order to achieve effective temperature control, and using a conventional deposition supply it is common to the heating structure of much larger, and an insulating material excellent in heat-conductive solid volume than the volume of organic filler. 고 열전도성은 구조체의 우수한 온도 균일화를 가능케 하고, 큰 열 흡수능(thermal mass)은 온도 변화를 감소시킴으로써 온도를 매우 작은 범위내로 유지하게 한다. And allows for excellent temperature uniformity of the thermal conductivity and structure, a large heat absorption capacity (thermal mass) is to keep the temperature by decreasing the temperature within a very small range. 이러한 방법은 정상상태의 기화율 안정성에 대해서는 원하는 효과를 갖지만, 개시 상태에서는 불리한 효과를 갖는다. This method gatjiman the desired effect on steady-state vaporization rate stability, in the starting state has an adverse effect. 이들 장치들은 정상상태의 열적 평형에 이르기 전에 수시간 동안 개시 상태에서 조작됨에 따라 정상상태에서의 기화율을 달성하는 것이 일반적이다. These devices it is common to achieve the vaporization rate at the steady state as the operation in the starting state for several hours before reaching the thermal equilibrium of steady state. 종래 장치에 구비된 공급부의 또 다른 한계는 유기 충전물이 소모됨에 따라 증기 분기관(manifold)의 형태가 변한다는 점이다. Another limitation of the supply unit provided in the prior art devices is that as the organic filler is consumed, changes the shape of the vapor manifold (manifold). 이러한 변화는 일정한 기화율을 유지하기 위해 가열기 온도를 변화시키는 것을 필요로 하는데, 공급부에서의 유기물질 농도 및 분포에 따라 오리피스를 나오는 증기의 플룸 모양이 변하는 것으로 관찰된다. This change is to require that for changing the heater temperature to maintain a constant vaporization rate, and is observed to change the plume shape of the vapor in accordance with the organic substance concentration and coming out of the distribution orifices of the supply unit. 따라서, 본 발명의 목적은 유기물질을 분해가 일어날 수 있는 온도에서의 노출을 제한하면서 기화시키는 장치 및 방법을 제공하는 것이다. Accordingly, it is an object of the invention to provide an apparatus and method for gasifying while limiting the exposure of the temperature that may occur the decomposition of organic material. 본 발명의 추가 목적은 단일 공급부로 둘 이상의 유기물질 성분들을 증착할 수 있게 하는 것이다. A further object of the invention is to be able to deposit two or more organic material components of a single supply. 본 발명의 추가 목적은 정상상태 기화율을 빠르게 달성하는 것이다. A further object of the invention is to quickly achieve a steady-state vaporization rate. 본 발명의 추가 목적은 유기물질의 다량 충전 및 정상상태 가열기 온도로 정상상태 기화율을 유지하는 것이다. A further object of the invention is to maintain the steady-state vaporization rate with a large amount charged and the steady state heater temperature of the organic material. d) 유기물질을, 제2 가열 영역에 체류하는 유기물질이 원하는 기화율-의존성 기화온도에서 가열되도록 제어된 속도로 제 1 가열영역에서 제 2 가열영역으로 미터링(metering)하여, 유기물질을 기판 표면상에서 승화시켜 박막을 형성하는 단계를 포함하는, 기판 표면상에 유기물질을 기화시켜 박막을 형성하는 방법에 의해 달성된다. d) an organic material, the second heating zone the organic material desired vaporization rate to stay in the - by metering (metering) in the first heating zone at a controlled rate so that the heat from the dependent vaporization temperature in a second heating zone, the substrate of organic material to transform, on the surface forming a thin film by vaporizing an organic material on the substrate surface is achieved by a method for forming a thin film. 본 발명의 장치는 유기물질 중 소량만을 제어된 속도로 원하는 기화율-의존성 기화온도로 가열하여 종래 기술의 가열 및 용량 한계를 극복한다는 점에서 유리하다. Device according to the present invention is desired vaporization rate with a small amount of only the control speed of the organic material - it is advantageous in that it overcomes the heating and capacity limitations of the prior art, heated to vaporization temperature dependence. 그러므로, 본 발명은 다량 충전된 유기물질 및 정상상태 가열기 온도에서 정상상태 기화율을 유지하는 것을 특징으로 한다. Thus, the present invention is characterized by maintaining a steady-state vaporization rate in a large amount of the charged organic material and a steady state heater temperature. 따라서, 본 발명의 장치는 온도에 매우 민감한 유기물질이라도 분해의 위험을 실질적으로 감소시키면서 공급부의 장기 조작을 가능케 한다. Thus, the apparatus of the present invention of even very sensitive organic material in the temperature while substantially reducing the risk of degradation and allows for long-term operation of the supply unit. 이러한 특징은 또한 기화율 및 분해 온도 한계치가 상이한 물질들이 동일한 공급부에서 동시 승화되는 것을 가능케 한다. This feature is also vaporization rate and the decomposition temperature threshold is different from a material that makes it possible to be co-sublimated in the same supply. 본 발명의 추가 장점은 더욱 미세한 속도 제어를 가능케 하여 독립적인 기화율 측정이 가능하다는 것이다. A further advantage of the present invention enables a finer speed control that it is possible independent vaporization rate measurement. 본 발명의 추가 장점은 수초 동안에 냉각 및 재가열을 수행함으로써 기화를 중지 및 재개시하고 정상상태 기화율에 빨리 도달할 수 있다는 점이다. A further advantage of the present invention is that when the stop vaporized by performing the cooling and re-heating during a few seconds and resumes, and can quickly reach a steady-state vaporization rate. 이러한 특징은 기판을 코팅하지 않는 경우 증착 챔버벽의 오염을 감소시키고 유기물질을 보호한다. This feature reduces the contamination of the deposition chamber wall does not coat the substrate and to protect the organic materials. 본 발명의 추가 장점은 유기물질의 분해 없이 종래 기술에 비해 상당히 높은 기화율을 달성하는 점이다. A further advantage of the present invention is to achieve a very high vaporization rate as compared to the prior art without degradation of the organic material. 또한, 공급 물질 소모에 따른 가열기 온도 변화를 필요로 하지 않는다. In addition, the heater does not require a temperature change in feed material consumption. 본 발명의 추가 장점은 증기원을 어떠한 배향으로나 제공할 수 있는 점이며, 이는 종래 기술에서는 가능하지 않았던 것을 달성한 것이다. A further advantage of the present invention is a point that can provide a vapor source eurona any orientation, which is achieved that was not possible in the prior art. 도 6은 본 발명에 따라 제조될 수 있는 OLED 장치 구조의 단면도이다. Figure 6 is a cross-sectional view of an OLED device structure that can be made according to the present invention. 도 1을 참조해 보면, 본 발명의 장치의 한 가지 구체예에 대한 단면이 도시되어 있다. Referring also to Figure 1, there is a cross-sectional view of a one embodiment of the apparatus of the present invention is shown. 기화 장치(5)는 유기물질들을 기판 표면상에서 기화시켜 박막을 형성하기 위한 장치로서, 제 1 가열영역(25) 및 이 영역과 이격되어 있는 제 2 가열영역(35)을 포함한다. Vaporization apparatus 5 includes an apparatus for forming a thin film by vaporizing the organic material on the substrate surface, the first heating zone 25 and the heating region and the second region that is apart (35). 제 1 가열영역(25)은 베이스 블록(20)으로 나타낸 제 1 가열수단을 포함하는데, 이는 가열 베이스 블록이나 냉각 베이스 블록, 또는 이들 둘다가 될 수 있으며, 제어 통로(30)를 포함할 수 있다. A first heating zone (25) includes a first heating means represented by base block 20, which can be a heating base block or a cooling base block, or both, may include a control passage 30 . 챔버(15)는 다량의 유기물질(10)을 수용할 수 있다. Chamber 15 can accommodate a large amount of organic material (10). 제 2 가열영역(35)은 분기관(60) 및 투과성 부재(40)에 의해 경계되는 영역을 포함하며, 이 경계영역은 분기관(60)의 일부일 수 있다. A second heating region 35 comprises the region bounded by manifold 60 and permeable member 40, a boundary region may be part of a manifold 60. The 분기관(60)은 또한 하나 이상의 개구부(90)를 포함한다. Manifold 60 also includes one or more openings (90). 유기물질을 미터링하는 수단으로는 유기물질(10)을 수용하기 위한 챔버(15), 챔버(15)내의 유기물질(10)을 올리기 위한 피스톤(50), 및 투과성 부재(40)가 포함된다. A means for metering the organic material is included in the chamber 15, piston 50, and the transmitting member 40 for raising organic material 10 in the chamber 15 for accommodating an organic material (10). 기화 장치(5)는 또한 하나 이상의 차폐부(70)를 포함한다. Vaporization apparatus 5 also includes one or more shields (70). 유기물질(10)은 압축 또는 사전응축된 고형물인 것이 바람직하다. Organic material 10 is preferably in the compressed or pre-condensed solid. 그러나, 분말 형태의 유기물질이 또한 사용될 수 있다. However, the organic material in powder form may also be used. 유기물질(10)은 단일 성분을 포함하거나, 상이한 기화 온도를 갖는 둘 이상의 유기 성분들을 포함할 수 있다. Organic material 10 can comprise two or more organic components comprise a single component or having a different vaporization temperature. 유기물질(10)은 베이스 블록(20)인 제 1 가열수단과 가깝게 열 접촉한다. Organic material 10 is in thermal contact closely with the first heating means, the base block 20. 베이스 블록을 통과하는 제어 통로(30)에는 온도제어 유체, 즉 제 1 가열영역(25)으로부터 열을 흡수하거나 이에 열을 전달하도록 채택된 유체가 흐른다. Control passage 30 passing through the base block, the temperature control fluid, that is, the first absorbing heat from the heating region 25, or this flow a fluid adapted to transfer heat. 상기 유체는 기체, 액체 또는 이들의 혼합 상태일 수 있다. The fluid may be a gas, liquid or mixed state of these. 기화 장치(5)는 제어 통로(30)를 통해 유체를 펌핑하는 수단을 포함한다. The vaporization device 5 comprises means for pumping fluid through a control passage (30). 상기 펌핑 수단은 도시되지 않았으며, 당해분야에 널리 공지되어 있다. Was the pumping means is not shown, it is well known in the art. 그러한 수단들을 통해, 유기물질(10)은 제 1 가열영역(25)에서 기화 온도 미만의 온도까지 가열된다. Through such means, organic material 10 is heated to a temperature less than the vaporizing temperature in the first heating zone (25). 기화 온도는 다양한 방식으로 결정될 수 있다. Vaporization temperature can be determined in a variety of ways. 예를 들어, 도 2는 OLED 장치에서 통상적으로 사용되는 2가지 유기물질들에 대한 온도와 증기압의 관계를 나타낸 그래프를 도시한 것이다. For example, Figure 2 illustrates a graph showing the relationship between temperature and vapor pressure for the two kinds of organic materials commonly used in OLED devices. 기화율은 증기압에 비례하며, 원하는 기화율과 관련하여, 도 2의 자료가 그 원하는 기화율에 도달하는데 필요한 가열온도를 정하는데 사용될 수 있다. Vaporization rate is proportional to the vapor pressure, and with respect to the desired vaporization rate, the data of Figure 2 can be used to determine the heating temperature required to reach the desired vaporization rate. 제 1 가열영역(25)은 유기물질(10)이 소모됨에 따라 일정한 가열온도로 유지된다. The first heating zone 25 is maintained at a constant heating temperature as organic material 10 is consumed. 유기물질(10)은 제어된 속도로 제 1 가열영역(25)에서 제 2 가열영역(35)으로 미터링된다. Organic material 10 is metered into the second heating region 35 in the first heating region 25 at a controlled rate. 제 2 가열영역(35)은 유기물질(10)의 기화온도 또는 이의 유기 성분들의 각 기화 온도 이상의 온도로 가열된다. The second heating zone 35 is heated to vaporization temperature or above the vaporization temperature of each of its organic components in the temperature of the organic material (10). 임의의 유기 성분은 연속적인 온도에 걸쳐 상이한 속도로 기화하기 때문에, 온도에 대한 기화율의 로그적 함수 관계가 성립한다. Any organic component is due to gasification at different speeds over a continuous temperature, is established the group ever log function of the ratio of the temperature. 원하는 증착률의 선택에 따라, 유기물질(10)의 필요한 기화 온도가 또한 결정되며, 이를 원하는 기화율-의존성 기화온도라고 칭하게 될 것이다. According to the selection of a desired deposition rate, the gasification temperature needs of the organic material 10 also is determined, the desired vaporization rate it - will be called chinghage dependent vaporization temperature. 제 1 가열영역(25)의 온도는 기화 온도 미만인 반면, 제 2 가열영역(35)의 온도는 원하는 기화율-의존성 기화 온도 또는 그 이상이다. The temperature of the first heating zone, while a temperature of 25 is less than the vaporization temperature, the second heat zone 35 is desired vaporization rate-dependent vaporization temperature of the or more. 본 구체예에서, 제 2 가열영역(35)은 분기관(60) 및 투과성 부재(40)에 의해 경계되는 영역을 포함한다. In this embodiment, second heating region 35 comprises the region bounded by manifold 60 and permeable member 40. 유기물질(10)은 피스톤(40)에 의해 투과성 부재(40) 쪽으로 밀려지며, 가압 제어식 구동 메카니즘을 통해 제어될 수 있다. Organic material 10 is pushed toward becomes permeable member 40 by piston 40, it can be controlled via a pressure-controlled drive mechanism. 피스톤(50), 챔버(15), 및 가압 제어식 구동 메카니즘은 미터링 수단으로 포함된다. Piston 50, chamber 15, and the pressure-controlled drive mechanism which is incorporated as metering means. 이러한 미터링 수단은 유기물질(10)이 기화율에 따라 선형적으로 변화하는 제어된 속도로, 투과성 부재(40)를 통해 제 2 가열영역(35)으로 미터링되게 한다. The metering means is to be metered into the second heating region 35 at a controlled rate of linear change in, through the permeable member 40, according to the organic material 10. The vaporization rate. 제 2 가열영역(35)의 온도에 따라, 유기물질(10)의 기화율의 미세한 제어가 가능하며, 이에 의해 또한 기화율이 독립적으로 측정된다. 2 with the temperature of the heating area 35, it is possible a fine control of the vaporization rate of organic material 10, and thus also vaporization rate is measured according to the independent by. 얕은 단면부분의 유기물질(10)은 접촉 및 열전도에 의해, 원하는 기화율-의존성 온도(제 2 가열영역(35)의 온도임)로 가열됨으로써 기화된다. Organic material 10 of shallow cross-section portion is desired vaporization rate by the contact and heat transfer - is vaporized by being heated to a temperature dependence (which is the temperature of second heating region 35). 유기물질(10)이 둘 이상의 유기 성분들을 포함하는 경우, 제 2 가열영역(35)의 온도는 유기물질(10)의 각 성분들이 동시에 기화하도록 각 성분 기화 온도 이상의 온도로 선택된다. If it contains the organic substance (10) is two or more organic components, the second temperature of the heated region 35 is selected to be above the vaporization temperature of each component temperatures to vaporize the components of the organic material 10 at the same time. 유기물질(10)의 두께에 따라 200℃/mm 정도의 급격한 온도 구배(thermal gradient)가 얻어진다. Steep temperature gradient of about 200 ℃ / mm according to the thickness of the organic material (10) (thermal gradient) is obtained. 이러한 구배는 즉시 증발되는 물질 외의 물질을 모두 고온으로부터 보호한다. These gradients are immediately all the materials other than the material to be protected from high-temperature evaporation. 기화된 유기물 증기는 빠르게 투과성 부재(40)를 통과하여 다량의 가열 기체 분기관(60)내로 유입되거나 표적 기판상으로 직접 이동할 수 있다. The vaporized organic vapors may be moved rapidly permeable member 40 passes through the flow into the large amount of heated gas manifold 60 or directly onto the target substrate. 증기의 원하는 기화 온도에서의 체류 시간은 매우 짧으며, 따라서 열분해가 상당히 감소된다. Had a residence time at the desired vaporization temperature of the steam is very short, and thus the pyrolysis is significantly reduced. 승온, 즉 기화율-의존성 기화온도에서의 유기물질(10)의 체류시간은 종래의 장치 및 방법에 비해 차수 크기로 감소(즉, 종래 기술에서는 시간(hr) 또는 일(day) 단위인 반면 본 발명에서는 초(sec) 단위임)되며, 이는 유기물질(10)이 종래 기술에 비해 더 고온에서 가열되게 한다. Temperature rise, that is, vaporization rate-dependent vaporization residence time of organic material 10 in the temperature in comparison with the conventional apparatus and method for reducing (i.e., prior art to the order of magnitude of time (hr) or days (day) unit, while the in the second invention (sec) unit Im) and which causes the organic material 10 is further heated at high temperature compared to the prior art. 따라서, 본 발명의 장치 및 방법은 유기물질(10)의 상당한 분해 없이, 현저히 높은 기화율을 달성할 수 있다. Accordingly, the apparatus and method of the present invention without any significant decomposition of the organic material 10, it is possible to achieve remarkably high vaporization rate. 제 2 가열영역(35)에서 유지되는 유기물질(10)의 일정한 기화율 및 부피는 일정한 플룸 모양을 형성하고 유지한다. Second constant vaporization rate and volume of the organic material 10 to be maintained in the heating zone 35 to form and maintain a constant plume shape. 본원에서, 플룸이란 기화 장치(5)를 빠져나오는 증기 구름으로서 정의된다. As used herein, the plume is defined as the vapor cloud exiting vaporization device 5. 제 2 가열영역(35)이 제 1 가열영역(25) 보다 높은 온도에서 유지되므로, 제 2 가열영역(35)으로부터의 열은 대부분의 유기물질(10)의 온도를 제 1 가열영역(25)의 온도 이상으로 상승시키는 것이 가능하다. The second heating zone 35 is first heated so region maintained at a temperature above 25, the second heating zone column is the first heating zone the temperature of most organic materials (10) from (35) (25) of the above it is possible to increase the temperature. 그러므로, 제 1 가열수단은 또한 유기물질(10)을 소정의 온도 이상으로 상승시킨 후에 냉각시키는 것이 필요하다. Therefore, the first heating means is also necessary to cool after raising organic material 10 in a predetermined temperature or higher. 이것은 제어 통로(30)에서 유체의 온도를 변화시킴으로써 달성될 수 있다. This can be achieved by changing the temperature of the fluid in control passage 30. 분기관(60)이 사용되는 경우, 기화가 계속됨에 따라 압력이 형성되어 일련의 개구부(90)를 통해 증기 스트림 분기관(60)을 빠져나오게 된다. When the branch pipe 60 is used, the pressure is formed and exited the vapor stream manifold 60 through a series of openings (90) in accordance with the gasification continues. 분기관의 길이에 따른 전도성은 개구부 전도성의 합계 보다 대략 2차수 정도로 크도록 고안된다 (참조: 제러미 엠. 그레이스(Jeremy M. Grace) 등에 의해 공동 양도된 미국 특허출원 제10/352,558호(출원일: 2003년 1월 28일; 발명의 명칭: "Method of Designing a Thermal Physical Vapor Deposition System")). Conductivity along the length of the branch pipe is designed to be larger by approximately two orders of magnitude than the sum of the opening conductivity (see: Jeremy M. Grace (Jeremy M. Grace) or the like in commonly assigned U.S. Patent Application No. 10/352 558 by call (filing date: January 28, 2003; the title of the invention: "Method of Designing a Thermal Physical Vapor Deposition System")). 이러한 전도성 비율은 분기관(60) 내부의 우수한 압력 균일성을 도모함으로써, 기화율의 국부적인 비균일성이 잠재되어 있더라도, 공급부의 길이에 따라 분포된 개구부(90)를 통해 흐름 비균일성을 최소화한다. By this conductive ratio is achieved a good pressure uniformity within manifold 60, the vaporization rate of the local non-uniformity, even if the potential, through an opening (90) distributed along the length of the supply flow nonuniformity The minimized. 대면하고 있는 표적 기판으로 복사되는 열을 감소시킬 목적으로, 가열된 분기관(60)에 이웃하여 하나 이상의 열 차폐부(70)가 정위된다. The face-to-face and the target for the purpose of reducing the heat copy substrate, at least one neighbor by the heated manifold 60, heat shield 70, which is stereotactic. 이러한 열 차폐부는 이로부터 열을 제거할 목적으로 베이스 블록(20)에 열적으로 연결된다. These heat shield for the purpose of removing heat therefrom is thermally coupled to the base block 20. 차폐부(70)의 상부는 비교적 차거운 표면에서의 증기 응축을 최소화할 목적으로 개구부 평면 아래에 놓이도록 고안된다. The upper portion of the shield 70 is designed to be placed below the opening plane for the purpose of minimizing vapor condensation on the relatively cold surface. 유기물질(10) 중 소량, 즉 제 2 가열영역(35)에 체류하는 부분만이 기화율-의존성 기화 온도로 가열되고, 대부분의 유기물질은 기화 온도 미만에서 잘 유지되기 때문에, 제 2 가열영역(35)에서의 가열을 차단함으로써, 예를 들어 피스톤(50)의 움직임을 중지하는 방식으로 기화를 차단하는 것이 가능하다. Organic material 10 is small, i.e., 20,000 parts staying in the heating region 35, the vaporization rate of - due to being heated to a dependent vaporization temperature, most of the organic material to be well kept at less than the vaporization temperature, the second heating zone by interrupting the heating at 35, for example, it is possible to block the vaporization in such a manner as to stop the movement of the piston 50. 이것은 기판 표면을 코팅하지 않은 경우 수행되어 유기물질(10)을 보호하고, 관련 장치, 예컨대 증착 챔버 벽의 오염을 최소화할 수 있으며, 이러한 사항은 하기에서 설명될 것이다. This can be performed in an organic protective material 10 if it is not coated on the substrate surface, and to minimize the associated device, such as contamination of the deposition chamber wall, this information will be described below. 투과성 부재(40)는 분말 또는 압축된 물질이 자유롭게 통과하는 것을 방지하는 미세한 메쉬 스크린일 수 있기 때문에, 기화 장치(5)는 어떠한 배향으로나 사용될 수 있다. Because permeable member 40 can be a fine mesh screen to prevent passage of the powder or compressed material freely, vaporization apparatus 5 can be used in any orientation eurona. 예를 들어, 기화 장치(5)는 그 아래에 위치한 기판을 코팅하도록 도 1에 도시된 것에서 180°각도로 배향되어 사용될 수 있다. For example, vaporization apparatus 5 can be aligned in an angle of 180 ° from the shown in Figure 1 so as to coat the substrate located underneath. 이러한 장점은 종래 기술의 가열 보트에서는 이루어지지 않았던 점이다. The advantage is that did not occur in the heating boats of the prior art. 한 가지 바람직한 구체예에서는 기화 장치(5)에 가열시 승화되는 분말 또는 압축 물질이 사용되었지만, 몇몇 구체예들에서는 유기물질(10)이 기화전에 액화되어 제 1 가열영역(5)의 온도에서 액체일 수 있는 물질일 수 있다. While one preferred embodiment uses a powder or compressed material that sublimes when heated to the vaporization apparatus 5, in some embodiments organic material 10 is liquefied before vaporized liquid at a temperature of the first heating zone (5) It may be a material that can be. 그러한 경우, 투과성 부재(40)는 모세관 작용을 이용한 제어방식으로 액화된 유기물질(10)을 흡수하여 보유함으로써 기화율을 제어할 수 있다. In such a case, permeable member 40 can control the vaporization rate by having to absorb the organic materials (10) liquid in a controlled manner by capillary action. 실제로, 기화 장치(5)는 다음과 같이 사용될 수 있다. In practice, vaporization apparatus 5 can be used as follows. 하나 이상의 성분들을 포함할 수 있는 다량의 유기물질(10)을 기화 장치(5)의 챔버(15)내로 공급한다. A quantity of organic material 10, which may comprise one or more components is introduced into the chamber 15 of the vaporizer (5). 제 1 가열영역(25)에서, 유기물질(10)은 각 유기 성분의 기화 온도 미만에서 활성적으로 유지된다. In the first heating region 25, organic material 10 is maintained at less than the vaporization temperature of the organic component actively. 제 2 가열영역(35)은 유기물질(10) 또는 각 성분의 기화 온도 이상의 온도로 가열된다. The second heating zone 35 is heated to a temperature of organic material 10, or at least the vaporization temperature of the components. 상기 유기물질(10)을 제어된 속도로 제 1 가열영역(25)에서 제 2 가열영역(35)으로 미터링한다. The metering by the control of the organic matter (10) speed in the first heating region 25 to second heating region 35. 얕은 단면부분의 유기물질(10)이 원하는 기화율-의존성 기화 온도에서 가열되어, 기화되어 기판 표면에 박막을 형성한다. Shallow section based organic material 10 is the desired ratio of partial-heat is dependent on the gasification temperature to form a thin film on the substrate surface is vaporized. 유기물질(10)이 다수의 성분을 포함하는 경우, 각 성분이 동시에 기화한다. When the organic material 10 is to include a number of components, and each component is vaporized at the same time. 도 3은 본 발명에 따른 장치의 제 2 구체예에 대한 단면을 도시한 것이다. Figure 3 illustrates a cross-sectional view of a second embodiment of the device according to the present invention. 기화 장치(45)는 상술한 바와 같이, 제 1 가열영역(25), 제 2 가열영역(35), 베이스 블록(20), 제어 통로(30), 챔버(15), 분기관(60), 개구부(90), 차폐부(70) 및 투과성 부재(40)를 포함한다. Vaporizer 45, a first heating region 25, second heating region 35, base block 20, control passages 30, chamber 15, manifold 60, as described above, It includes an opening 90, the shield 70 and the transparent member 40. 기화 장치(45)는 피스톤을 포함하지 않는 대신, 액체(65)를 포함한다. The gasification apparatus 45 comprises a place of which does not include a piston, the liquid (65). 유기물질(10)은 상술한 바와 같은 물질일 수 있으며 베이스 블록(20)과 가깝게 열접촉하고 있다. Organic material 10 can be a material as described above and may close thermal contact with base block 20. 유기물질(10)은 제어된 속도로 제 1 가열영역(25)에서 제 2 가열영역(35)으로 미터링되며, 여기에서 유기물질(10) 또는 각 성분들의 기화온도 이상의 온도로 가열된다. Organic material 10 is metered into the second heating region 35 in the first heating region 25 at a controlled rate and is heated to a temperature where the organic material 10, or at least the vaporization temperature of each component. 유기물질(10)은 낮은 증기압 액체(65)와의 접촉을 통해 투과성 부재(40) 쪽으로 밀려진다. Organic material 10 is pushed toward the transparent member 40 through contact with the low vapor pressure liquid (65). 액체(65)는 기화 장치(45)의 조작 온도에서 액체이어야 한다. The liquid 65 is to be liquid at the operating temperature of the vaporizer (45). 예를 들어, OLED 장치에 통상 사용되는 여러 가지 유기물질들은 150℃ 이상의 기화 온도를 갖는다. For example, conventional various organic materials used in OLED devices have a vaporization temperature of at least 150 ℃. 그러므로, 액체(65)는 그러한 유기물질을 위해 150℃에서 액체일 수 있다. Therefore, the liquid 65 may be a liquid at 150 ℃ for such organic materials. 액체(65)는 유기물질(10)과 베이스 블록(20) 간에 매우 우수한 열접촉 및 밀폐 실링을 제공할 수 있다. Liquid 65 can provide very good thermal contact and a closed sealing between the organic material 10 and base block 20. 이러한 목적에는 갈륨, 갈륨과 인듐의 합금, 및 비스무트와 인듐의 제어 팽창 합금을 포함한 저융점의 액체 금속이 적합하다. For this purpose, the liquid metal having a low melting point, including control expansion alloy of gallium, gallium and indium alloys, and bismuth and indium are suitable. 이들 물질은 높은 열전도성을 가져 유기물질과 냉각 블록 사이에 매우 우수한 열접촉 및 밀폐 실링을 제공한다. These materials provide high thermal conductivity brought very good thermal contact and a closed sealing between the organic material and the cooling block. 또한, 낮은 증기압의 오일이 적합하다. Further, it is suitable for the low vapor pressure of the oil. 액체(65)로서 허용가능한 기타 물질로는 유기물질(10) 보다 밀도가 높고, 증기 장치(5)에 적용된 온도 범위에 걸쳐 유기물질(10)의 증기압 보다 낮은 증기압을 가져, 유기물질(10)과 반응하지 않는 물질들이 있다. Acceptable other substances is higher in density than organic material 10, the vapor pressure brought to a lower vapor pressure, an organic material of the organic material 10 over the temperature range applied to the steam unit (5) as the liquid (65) (10) there are not as reactive materials. 유기물질(10)은 그러한 높은 표면 장력 및 밀도를 갖는 액체의 표면상에 떠 있으며, 매우 제어가능한 힘으로 투과성 부재(40) 쪽으로 밀려질 수 있다. Organic material 10 is such a high surface tension and are floating on the surface of the liquid has a density, it can be pushed into a very controllable force-transmitting member (40). 이러한 제어가능한 힘은 투과성 부재(40)의 온도에 따라, 유기물질 기화율의 정확한 제어를 가능케 한다. Such controllable force in accordance with the temperature of permeable member 40, permits precise control of the vaporization rate of organic material. 얕은 단면부분의 유기물질(10)이 접촉 및 열전도에 의해, 원하는 기화율-의존성 온도, 즉 투과성 부재(40)의 온도로 가열됨으로써 기화된다. Organic material 10 of shallow cross-section part by the contact and heat conduction, the desired vaporization rate - is vaporized by being heated to the temperature dependence, i.e., the temperature of permeable member 40. 유기물질(10)의 두께에 따라 200℃/mm 정도의 급격한 온도 구배(thermal gradient)가 얻어진다. Steep temperature gradient of about 200 ℃ / mm according to the thickness of the organic material (10) (thermal gradient) is obtained. 이러한 구배는 즉시 증발되는 물질 외의 물질을 모두 고온으로부터 보호한다. These gradients are immediately all the materials other than the material to be protected from high-temperature evaporation. 기화된 유기물 증기는 빠르게 투과성 부재(40)를 통과하여 다량의 가열 기체 분기관(60)내로 유입되거나 표적 기판상으로 직접 이동할 수 있다. The vaporized organic vapors may be moved rapidly permeable member 40 passes through the flow into the large amount of heated gas manifold 60 or directly onto the target substrate. 증기의 원하는 기화 온도에서의 체류 시간은 매우 짧으며, 따라서 열분해가 상당히 감소된다. Had a residence time at the desired vaporization temperature of the steam is very short, and thus the pyrolysis is significantly reduced. 분기관(60)이 사용되는 경우, 기화가 계속됨에 따라 압력이 형성되어 일련의 개구부(90)를 통해 증기 스트림 분기관(60)을 빠져나오게 된다. When the branch pipe 60 is used, the pressure is formed and exited the vapor stream manifold 60 through a series of openings (90) in accordance with the gasification continues. 분기관의 길이에 따른 전도성은 그레이스(Grace) 등에 의해 기술된 바와 같이, 개구부 전도성의 합계 보다 대략 2차수 정도로 크도록 고안된다. Conductivity along the length of the branch pipe is designed to be larger, as described by Grace (Grace), by approximately two orders of magnitude than the sum of the opening conductivity. 이러한 전도성 비율은 분기관(60) 내부의 우수한 압력 균일성을 도모함으로써, 기화율의 국부적인 비균일성이 잠재되어 있더라도, 공급부의 길이에 따라 분포된 개구부(90)를 통해 흐름 비균일성을 최소화한다. By this conductive ratio is achieved a good pressure uniformity within manifold 60, the vaporization rate of the local non-uniformity, even if the potential, through an opening (90) distributed along the length of the supply flow nonuniformity The minimized. 기화 장치(5)와 유사하게, 기화 장치(45)도 액체 유기물질(10)을 사용할 수 있다. Likewise, the vaporizer and the vaporizer (5) (45) may also be used a liquid organic material 10. FIG. 도 4는 본 발명에 따른 장치의 제 3 구체예에 대한 단면을 도시한 것이다. Figure 4 illustrates a cross-sectional view of a third embodiment of the device according to the invention. 기화 장치(55)는 앞서 기술된 바와 같이, 제 1 가열영역(25), 베이스 블록(20), 제어 통로(30), 챔버(15), 분기관(60) 및 개구부(90)를 포함한다. The gasification apparatus 55 comprises a first heating region 25, base block 20, control passages 30, chamber 15, manifold 60 and opening 90, as described above . 제 2 가열영역(35)은 제 2 가열수단을 포함한다. A second heating zone (35) comprises a second heating means. 제 2 가열수단은 유도 또는 RF 커플링을 통해 회전 드럼(105)의 표면내로 혼입될 수 있으며, 회전 드럼(105)의 표면에 아주 근접하여 복사 가열 부재를 포함하거나, 저항성 가열 수단을 포함할 수 있다. The second heating means can be incorporated into the surface of the rotating drum 105 through induction or RF coupling, and in close proximity to the surface of the rotary drum 105, including a radiant heating element, or may include a resistance heating means, have. 이 구체예에서의 기화율은 회전 드럼(105)의 회전률 및 드럼 표면에 이송된 유기물질(10)의 양에 의해 제어된다. Vaporization rate in this embodiment is controlled by the amount of organic material 10 transferred to the slew rate and the drum surface of the rotary drum (105). 이러한 가열 메카니즘에 의해, 회전 드럼(105) 표면상에서 실질적으로 모든 유기물질(10)을 증기상태로 간단하게 변환시킬 수 있다. With such a heating mechanism, a rotary drum 105 substantially all of the organic material 10 on the surface can be easily converted to a vapor state. 기화된 유기물 증기는 빠르게 제 2 가열영역(35)을 통과하여 일정 부피의 가열된 기체 분기관(60)에 유입되거나 표적 기판상으로 직접 진행할 수 있다. The vaporized organic vapors can proceed rapidly second heating region 35 through an inlet to the heated gas manifold 60 of a volume or directly onto the target substrate. 기화 온도에서의 체류 시간은 매우 짧으며, 따라서 열분해가 상당히 감소된다. It was the residence time in the evaporation temperature is very short, so that thermal decomposition is substantially reduced. 기화 장치(5)와 유사하게, 기화 장치(55)도 액체 유기물질(10)을 사용할 수 있다. Likewise, the vaporizer and the vaporizer (5) (55) may also be used a liquid organic material 10. FIG. 도 5를 참조하면, 기판을 둘러싸고 있는 증착 챔버를 포함하는 본 발명의 장치의 구체예가 도시되어 있다. Referring to Figure 5, a specific example is shown of the apparatus according to the present invention including a deposition chamber enclosing a substrate. 증착 챔버(80)는 OLED 기판(85)이 기화 장치(5)로부터 이송된 유기물질(10)로 코팅되게 하는 밀폐형 장치이다. A deposition chamber 80 is a sealed unit to be coated with organic material 10 transferred OLED substrate 85 from the vaporizer (5). 증착 챔버(80)는 제어된 조건, 예를 들어 진공 공급부(100)에 의해 제공되는 1 Torr 이하의 압력으로 유지된다. A deposition chamber 80 is a control condition, for example, is maintained at a pressure of 1 Torr or less provided by vacuum outlet portion 100. 증착 챔버(80)는 코팅되지 않은 OLED 기판(85)을 로딩하는데 사용될 수 있는 로드 락(75) 및 로딩되지 않은 코팅 OLED 기판을 포함한다. The deposition chamber 80 includes load lock 75 and the coated OLED substrates are not loaded that can be used to load uncoated OLED substrates 85. OLED 기판(85)은 병진운동 장치(95)에 의해 이동되어 OLED 기판(85)의 전체 표면이 기화된 유기물질(10)로 고르게 코팅된다. OLED substrate 85 is coated evenly with translational motion device (95) is moved by the organic material 10 vaporizes the entire surface of OLED substrate 85. 기화 장치(5)가 증착 챔버(80)에 의해 부분적으로 둘러싸인 것으로 도시되어 있을지라도, 기화 장치(5)가 증착 챔버(80)에 의해 전체적으로 둘러싸이는 배열을 비롯하여, 다른 배열도 가능함을 주지하여야 한다. Vaporizer 5 is although shown as partially enclosed by deposition chamber 80, a vaporizer (5) is surrounded entirely by the vapor deposition chamber 80 which, as well as an array, it should be note that also possible different arrangement . 실제로, OLED 기판(85)은 로드 락(75)를 통해 증착 챔버(80)에 장착되고 병진운동 장치(95) 또는 관련 장치에 의해 유지된다. In fact, OLED substrate 85 is mounted in the deposition chamber 80 via load lock 75 is held by the translation device (95) or a related device. 기화 장치(5)는 상술한 바와 같이 조작되며, 병진운동 장치(95)가 OLED 기판(85)을 유기물질(10) 증기가 기화 장치(5)로부터 나오는 방향에 수직으로 이동시킴에 따라, OLED 기판(85)의 표면상에 유기물질(10)의 박막이 형성된다. Vaporization apparatus 5 according to Sikkim move operation is the translational motion device (95) the OLED substrate 85 as described above, normal to the direction in which the organic material 10 vapors from vaporization apparatus 5, OLED the thin film of organic material 10 is formed on the surface of the substrate 85. 도 6은 본 발명에 따라 일부 제조될 수 있는 발광 OLED 장치(110)의 픽셀 단면을 도시한 것이다. 6 illustrates a pixel section of a light-emitting OLED device 110 that can be a part made in accordance with the present invention. OLED 장치(110)는 최소한, 기판(120), 음전극(190) 및 이와 이격되어 있는 양전극(130), 및 발광층(150)을 포함한다. The OLED device 110 includes at a minimum a substrate 120, a cathode electrode 190, and this is separated from the positive electrode 130, and the light emitting layer 150 that. OLED 장치는 또한 정공 주입층(135), 정공 수송층(140), 전자 수송층(155) 및 전자 주입층(160)을 포함할 수 있다. OLED devices can also include a hole-injection layer 135, hole transport layer 140, an electron transport layer 155 and the electron injection layer 160. 정공 주입층(135), 정공 수송층(140), 발광층(150),전자 수송층(155) 및 전자 주입층(160)은 양전극(130)과 음전극(190) 사이에 배치된 일련의 유기층(170)을 구성한다. Hole injection layer 135, hole transport layer 140, light emitting layer 150, an electron transport layer 155 and the electron injection layer 160 is a series of organic layers 170 disposed between the positive electrode 130 and negative electrode 190 constitute. 유기층(170)은 본 발명의 장치 및 방법에 의해 가장 바람직하게 증착된 층이다. The organic layer 170 is most preferably deposited layer by the apparatus and method of the present invention. 이들 성분들은 이하에서 상세하게 기술될 것이다. These components will be described in detail below. 기판(120)은 유기물 고체, 무기물 고체, 또는 유기물과 무기물의 고체일 수 있다. Substrate 120 may be an organic solid, the solid inorganic material, or organic and inorganic solid. 기판(120)은 단단하거나 유연할 수 있으며, 시트 또는 웨이퍼와 같은 별도의 개별 피이스(piece)로서나 연속적 롤로서 가공될 수 있다. Substrate 120 may be rigid or flexible, as a separate individual piece (piece) such as sheets or wafers, or can be processed as a continuous roll. 전형적인 기판 재질로는 유리, 플라스틱, 금속, 세라믹, 반도체, 금속 산화물, 반도체 산화물, 반도체 질화물 또는 이들의 조합이 포함된다. Typical is the substrate material comprises a glass, plastic, metal, ceramic, semiconductor, metal oxide, semiconductor oxide, semiconductor nitride, or combinations thereof. 기판(120)은 그러한 재질들의 균질 혼합물이나 복합체, 또는 다중층으로 형성될 수 있다. Substrate 120 may be formed of a homogeneous mixture or complex, or a multiple layer of such material. 기판(120)은 OLED 기판, 즉 OLED 소자를 제조하는데 보통 사용되는 기판, 예를들어 활성-매트릭스 저온 폴리실리콘 또는 무정형-실리콘 TFT 기판일 수 있다. Board 120 is OLED substrate, that is, to manufacture an OLED device usually used substrates, for example, active-silicon TFT may be a substrate-matrix low-temperature polysilicon or amorphous. 기판(120)은 의도하는 발광 방향에 따라 광 투과성이거나 광 불투과성일 수 있다. Substrate 120 may be light-permeable or light impermeable, depending on the intended direction of light emission. 광 투과성은 기판을 통해 EL 발광을 보는데 바람직하다. Light transmission is desirable for viewing the EL emission through the substrate. 투명 유리 또는 플라스틱이 그러한 경우에 일반적으로 사용된다. Transparent glass or plastic is commonly used in such cases. EL 발광이 상부 전극을 통해 보이는 제품에서는, 기부 지지체의 투과 특징이 중요하지 않으며, 따라서 광투과성, 광흡수성 또는 광반사성일 수 있다. In products where the EL emission is visible through the top electrode, the transmissive characteristics of the base substrate may be not critical, and therefore light-transmissive, light absorbing or light reflective. 이러한 경우에 사용되는 기판으로는 유리, 플라스틱, 반도체 재질, 세라믹 및 회로판 재질, 또는 비활성(passive)-매트릭스 장치 또는 활성-매트릭스 장치일 수 있는 OLED 장치의 형성에 일반적으로 사용되는 기타 재질의 기판이 포함되나, 이에 국한되는 것은 아니다. The substrate used in this case is glass, plastic, semiconductor materials, ceramics, and circuit board materials, or inactive (passive) - the substrate of the other materials commonly used in the formation of OLED devices, which can be a matrix device-matrix devices or active They include, but are not limited to this. 기판(120) 위에 전극이 형성되며, 가장 일반적으로 양전극(130)으로서 배열된다. The electrode is formed on the substrate 120, it is most commonly arranged in a positive electrode (130). EL 발광이 기판(120)을 통해 보이는 경우, 양전극(130)은 관심 발광체에 대해 투명하거나 실질적으로 투명해야 한다. When the EL light emission seen through the substrate 120, the positive electrode 130 should be transparent or substantially transparent for the light-emitter of interest. 본 발명에서 사용가능한 통상적인 투명 양전극 재질은 인듐-주석 산화물 및 주석 산화물이나, 비제한적으로 알루미늄- 또는 인듐-도핑된 아연 산화물, 마그네슘-인듐 산화물 및 니켈-텅스텐 산화물을 비롯한 기타 금속 산화물들도 사용될 수 있다. A typical transparent positive electrode material is indium can be used in the present invention-tin oxide and tin oxide or, but not limited to, aluminum- or indium-doped zinc oxide, magnesium-indium oxide, and nickel-also be used with other metal oxides, including tungsten oxide can. 이러한 산화물 이외에도, 질화갈륨과 같은 금속 질화물, 아연 셀라나이드와 같은 금속 셀레나이드, 및 황화아연과 같은 금속 황화물이 양전극 재질로서 사용될 수 있다. In addition to these oxides, metal sulfides, such as a metal selenide, and zinc sulfide, such as metal nitrides, such as gallium arsenide Cellar zinc can be used as a positive electrode material. EL 발광이 상부 전극을 통해 보이는 경우에는, 양전극 재질의 투과 특징이 중요하지 않으며, 투명, 불투명 또는 반사성의 어떠한 전도성 재질이든 사용될 수 있다. When the EL light emission seen through the top electrode, the transmissive characteristics of the positive electrode material is not critical, transparent, may be used or any conductive material of the opaque or reflective. 이러한 경우에 사용되는 전도성 재질의 예로는 금, 이리듐, 몰리브덴, 팔라듐 및 백금이 사용될 수 있으나, 이에 국한되는 것은 아니다. Examples of the conductive material used in this case include, but are gold, iridium, molybdenum, palladium, and platinum may be used, but is not limited to this. 바람직한 양전극 재질은 투명성이든 그렇지 않든, 4.1 eV 이상의 일함수(work function) 값을 갖는다. Preferred positive electrode material, whether or not transparent, and has a 4.1 work function (work function) eV or more values. 바람직한 양전극 재질은 증발, 스퍼터링, 화학증착, 또는 전기화학적 수단 등의 적합한 방식으로 증착될 수 있다. Preferred positive electrode material may be deposited in a suitable way such as evaporation, sputtering, chemical vapor deposition, or electrochemical means. 양전극 재질은 널리 공지된 광식각 공정을 사용하여 패턴화될 수 있다. A positive electrode material can be patterned using well known When Romance each process. 유기발광 표시장치에서, 항상 필요하지는 않을지라도, 정공 주입층(135)이 양전극(130) 위에 형성되는 것이 종종 유용하다. Although in the organic light emitting display device, may not always be necessary, it is hole-injection layer 135 is formed on the positive electrode 130 is often useful. 정공 주입 물질은 후속 유기층의 제막 특성을 개선시키고 정공 수송층으로의 정공 주입을 용이하게 할 수 있다. Hole-injecting material can improve the film formation property of subsequent organic layers and to facilitate injection of holes into the hole transport layer. 정공 주입층(135)으로 사용하기에 적합한 물질로는 미국 특허 제4,720,432호에 개시된 포피린계(porphyrinic) 화합물, 미국 특허 제6,208,075호에 개시된 플라즈마 증착 플루오르카본 중합체, 및 산화바나듐(VO x ), 산화몰리브덴(MoO x ), 산화니켈(NiO x ) 등을 비롯한 무기 산화물이 포함되나, 이에 국한되는 것은 아니다. Substances suitable for use as a hole injection layer 135 are described in U.S. Patent 4,720,432 porphyrin-based (porphyrinic) compounds, U.S. Patent No. 6,208,075 plasma deposited fluorocarbon polymers disclosed in, and vanadium oxide (VO x) disclosed in, oxide molybdenum (MoO x), nickel oxide (NiO x) include, but the inorganic oxide and the like, including, but not limited to: 유기 EL 장치에 유용한 것으로 알려진 또다른 정공 주입 물질이 EP 제0 891 121 A1호 및 EP 제1 029 909 A1호에 기술되어 있다. Another hole injection materials known to be useful in organic EL devices, the EP 0 891 121 A1 and EP 029 909 first is described in A1. 항상 필요하지는 않을지라도, 정공 수송층(140)이 양전극(130) 위에 형성되어 배치되는 것이 종종 유용하다. Although not always necessary, it is often useful that a hole transport layer 140 is disposed is formed on the anode electrode 130. 바람직한 정공 수송 물질은 증발, 스퍼터링, 화학증착, 전기화학적 수단, 열전달 또는 레이저 열전달과 같은 적합한 방식에 의해 도너 물질로부터 증착되거나, 본원에 기술된 장치 및 방법에 의해 증착될 수 있다. The preferred hole-transport material or deposited from the donor material by a suitable method such as evaporation, sputtering, chemical vapor deposition, electrochemical means, thermal heat transfer, or laser, may be deposited by the device and method described herein. 정공 수송층(140)에 유용한 정공 수송 물질은 널리 공지되어 있으며, 방향족 2차 아민, 즉 탄소 원자에만 결합되어 있고 방향족 고리의 구성원이 되는 하나 이상의 3가 질소 원자를 함유하는 화합물이 이에 포함된다. Useful hole transporting material in the hole transporting layer 140 are well known, in combination an aromatic secondary amine, i.e., only carbon atoms and one or more 3 being a member of an aromatic ring include compounds containing a nitrogen atom thereto. 방향족 3차 아민의 한 가지 유형으로는 아릴아민, 예컨대 모노아릴아민, 다이아릴아민, 트라이아릴아민 또는 중합체성 아릴아민을 들 수 있다. As one type of aromatic tertiary amine can be an arylamine, e.g., monoarylamine, diaryl amine, triarylamine, or a polymeric arylamine. 모노머성 트라이아릴아민의 예가 클루펠(Klupfel) 등의 미국 특허 제3,180,730호에 예시되어 있다. Of monomeric triarylamine An example is illustrated in U.S. Patent No. 3.18073 million, such as inclusions pel (Klupfel). 기타 적합한 트라이아릴아민으로서, 하나 이상의 비닐 라디칼로 치환되고/되거나 하나 이상의 활성 수소-함유 기를 포함하는 트라이아릴아민이 브랜틀리(Brantley) 등의 미국 특허 제3,567,450호 및 제3,658,520호에 개시되어 있다. Other suitable as triarylamine, at least one is substituted with a vinyl radical and / or one or more active hydrogen-triarylamine containing containing groups are disclosed in Brandt wrong (Brantley) et al, US Patent No. 3.56745 million) and (3.65852 million call. 더욱 바람직한 방향족 3차 아민은 미국 특허 제4,720,432호 및 제5,061,569호에 개시된 둘 이상의 방향족 3차 아민 잔기를 포함하는 화합물이다. The more preferred aromatic tertiary amine is a compound comprising at U.S. Patent 4,720,432 and at least two aromatic tertiary amine moieties as disclosed in the No. 5,061,569. 그러한 화합물들은 하기 화학식 A로 표시되는 화합물을 포함한다. Such compounds include the compounds represented by formula (A) below. G는 아릴렌, 사이클로알킬렌, 또는 탄소-탄소 결합의 알킬렌기와 같은 연결기이다. G is arylene, cycloalkylene, or a carbon-carbon bond of a linking group such as an alkylene group. 한 가지 구체예에서, Q 1 및 Q 2 중 하나 이상은 다환형의 융합된 고리 구조, 예를 들어 나프탈렌을 함유한다. In one embodiment, the at least one of Q 1 and Q 2 is a fused ring structure of a cyclic, e.g., containing naphthalene. G가 아릴기인 경우, 이것은 편리하게 페닐렌, 바이페닐렌 또는 나프탈렌 잔기이다. When G is an aryl group, this is conveniently a phenylene, biphenylene, or naphthalene moiety. 화학식 A를 만족하고 2개의 트라이아릴아민 잔기를 함유하는 트라이아릴아민의 유용한 예가 하기 화학식 B로 표시된다. Satisfy the formula (A) and two tri-aryl to the triarylamine containing amine moieties useful example is represented by the formula B. 상기식에서, R 5 및 R 6 은 각각 독립적으로 선택된 아릴기이다. 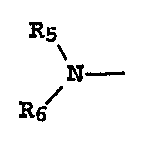 Wherein, R 5 and R 6 is an aryl group, each independently selected. 한 가지 구체예에서, R 5 및 R 6 중 하나 이상은 다환형의 융합된 고리 구조, 예를 들어 나프탈렌을 함유한다. In one embodiment, the R 5 and R 6 is one or more of the fused ring structure of a cyclic, e.g., containing naphthalene. 또 다른 부류의 방향족 2차 아민은 테트라아릴다이아민이다. Another class of aromatic secondary amines are tetraaryldiamines. 바람직한 테트라아릴다이아민은 화학식 C로 나타낸 바와 같이, 아릴렌기를 통해 결합된 2개의 다이아릴아미노기를 포함한다. Preferred tetraaryldiamines include, arylene groups the two diaryl amino group bonded via as indicated by Formula C. 유용한 테트라아릴다이아민은 하기 화학식 D로 표시되는 화합물을 포함한다. Useful tetraaryldiamines include the compounds represented by formula D below. Ar, R 7 , R 8 및 R 9 는 독립적으로 선택된 아릴기이다. Ar, R 7, R 8 and R 9 is an aryl group selected independently. 대표적인 구체예에서, Ar, R 7 , R 8 및 R 9 중 하나 이상은 다환형의 융합된 고리 구조, 예를들어 나프탈렌이다. In an exemplary embodiment, Ar, R 7, R 8 and R 9 is one or more of the naphthalene is for the fused ring structure, for example of annular shape. 상기 화학식 A, B, C 및 D의 다양한 알킬, 알킬렌, 아릴 및 아릴렌 잔기는 각각 추가로 치환될 수 있다. Various alkyl, alkylene, aryl, and arylene moieties of the formula A, B, C and D may be further substituted, respectively. 대표적인 치환기로는 알킬기, 알콕시기, 아릴기, 아릴옥시기, 및 불소, 염소 및 브롬과 같은 할로겐이 포함된다. Representative substituents include a halogen, such as alkyl groups, alkoxy groups, aryl groups, aryloxy groups, and fluorine, chlorine and bromine. 다양한 알킬 및 알킬렌 잔기는 보편적으로 1 내지 약 6개의 탄소 원자를 함유한다. Various alkyl and alkylene moieties are common one to contain from about 6 carbon atoms. 사이클로알킬 잔기는 3 내지 약 10개, 보편적으로는 5개, 6개 또는 7개의 탄소 원자를 함유할 수 있으며, 예를들어 사이클로펜틸, 사이클로헥실 및 사이클로헵틸 고리 구조이다. Cycloalkyl moieties is from 3 to about 10, is universally 5, may contain a six or seven carbon atoms, for example cyclopentyl, a cyclohexyl, and cycloheptyl ring structures. 아릴 및 아릴렌 잔기는 일반적으로 페닐 및 페닐렌 잔기이다. The aryl and arylene moieties are typically phenyl and phenylene moieties. OLED 장치의 정공 수송층은 방향족 3차 아민 화합물 단독 또는 이의 혼합물로 형성될 수 있다. A hole transport layer of the OLED device can be formed of an aromatic tertiary amine compound alone, or a mixture thereof. 구체적으로, 트라이아릴아민, 예컨대 화학식 B를 만족하는 트라이아릴아민과 화학식 D로 표시되는 바와 같은 테트라아릴다이아민이 조합되어 사용될 수 있다. Specifically, triarylamine, such as may be used are tetra-aryl diamine Min combination as represented by Formula D and triarylamine satisfying the Formula B. 트라이아릴아민이 테트라아릴다이아민과 조합하여 사용되는 경우, 테트라아릴다이아민은 트라이아릴아민과 전자 주입 및 수송층 사이에 배치된 층으로서 정위된다. Tri-aryl If the amine is used in combination with tetraaryldiamines, tetraaryldiamines is orientation as the layer disposed between the triarylamine and the electron injecting and transporting layer. 본원에 기술된 장치 및 방법은 단일 또는 다수 성분의 층들을 증착하는데 사용될 수 있으며, 다수층을 연속적으로 증착하는데 사용될 수 있다. The apparatus and methods described herein may be used in depositing layers of single or multiple component, and may be used to deposit multiple layers in succession. 또 다른 부류의 정공 수송층 재질로는 EP 제1 009 041호에 개시된 다환형 방 향족 화합물이 포함된다. In addition to the hole transport layer material is of different kind comprises a polycyclic room hyangjok compounds disclosed in EP 009 041 the first call. 또한, 중합체성 정공 수송 물질, 예컨대 폴리(N-비닐카바졸) (PVK), 폴리티오펜, 폴리피롤, 폴리아닐린, 및 폴리(3,4-에틸렌다이옥시티오펜)/폴리(4-스타이렌설포네이트)(PEDOT/PSS)와 같은 공중합체가 사용될 수 있다. In addition, polymeric hole transport materials such as poly (N- vinylcarbazole) (PVK), polythiophenes, polypyrrole, polyaniline, and poly (3,4-ethylene dioxythiophene) / poly (4-styrene sulfonate ) (copolymers can be used, such as PEDOT / PSS). 발광층(150)은 정공-전자의 재조합에 응답하여 빛을 발산한다. The light-emitting layer 150, a hole-electron recombination in response to the emit light. 발광층(150)은 일반적으로 정공 수송층(140) 위에 배치된다. The light-emitting layer 150 is commonly disposed over the hole-transporting layer 140. 바람직한 유기 발광 물질은 증발, 스퍼터링, 화학증착, 전기화학적 수단 또는 복사 열전달과 같은 적합한 방식에 의해 도너 물질로부터 증착되거나, 본원에 기술된 장치 및 방법에 의해 증착될 수 있다. Preferred organic light emitting material is deposited from a donor material and by any suitable method such as evaporation, sputtering, chemical vapor deposition, electrochemical means, or radiation heat transfer, and may be deposited by the apparatus and methods described herein. 유용한 유기 발광 물질들은 널리 공지되어 있다. Useful organic light emitting materials are well known. 미국 특허 제4,769,292호 및 제5,935,721호에 보다 구체적으로 기술된 바와 같이, 유기 EL 소자의 발광층은 발광 또는 형광 물질을 포함하며, 이 영역에서는 전자-정공 쌍의 재조합에 의해 전기발광이 이루어진다. As it described in U.S. Patent No. 4,769,292 and No. 5,935,721 more specifically to call, a light emitting layer of the organic EL element comprises a luminescent or fluorescent material, a region in the electron-made electroluminescence by the recombination of electron-hole pairs. 발광층은 단일 물질로 구성될 수 있으나, 보다 일반적으로는 호스트 물질 및 이를 도핑시키는 게스트 화합물 또는 도펀트를 포함하여, 주로 도펀트로부터 빛을 발광시킨다. The light-emitting layer, but may be of a single material, and, more generally, comprises a guest compound or dopant to the host material and doping it, thereby mainly emitting light from the dopant. 도펀트는 특정한 스펙트럼을 갖는 색광을 발산하도록 선택된다. The dopant is selected to emit a color light having a particular spectrum. 발광층의 호스트 물질은 하기에 정의되는 바와 같은 전자 수송 물질, 상기에 정의한 바와 같은 정공 수송 물질, 또는 정공-전자 재조합을 지지하는 또다른 물질일 수 있다. The host material of the light-emitting layer is the hole transport material, or a hole as defined in the electron-transporting material, as defined above for - may be another material that supports the electron recombination. 도펀트는 형광성이 높은 염료로부터 선택되는 것이 일반적이나, 인광성 화합물, 예를 들어 WO 제98/55561호, WO 제00/18851호, WO 제00/57676호 및 WO00/70655호에 개시된 전이금속 복합체가 또한 유용하다. The dopant is typically selected from high or a fluorescent dye, phosphorescent compounds, e.g., WO 98/55561 claim No., WO 00/18851 claim No., WO 00/57676 claim arc and WO00 / transition metal complex described in the No. 70 655 it is also useful. 도펀트는 보편적으로 호스트 물질내로 0.01 내지 10 중량%의 함량으로 혼입된다. Dopants are commonly incorporated in an amount of 0.01 to 10% by weight into the host material. 본원에 기술된 장치 및 방법은 다수의 기화 공급부 필요없이도, 다성분의 게스트/호스트 층들을 코팅하는데 사용될 수 있다. The apparatus and method described herein may be used without the need for multiple vaporization required supply, and to coat the guest / host layers of the component. 사용가능한 공지의 호스트 및 발광 물질로는 미국 특허 제4,768,292호, 제5,141,671호, 제5,150,006호, 제5,151,629호, 제5,294,870호, 제5,405,709호, 제5,484,922호, 제5,593,788호, 제5,645,948호, 제5,683,823호, 제5,755,999호, 제5,928,802호, 제5,935,720호, 제5,935,721호 및 제6,020,078호에 개시된 화합물이 포함되나, 이에 국한되는 것은 아니다. As a host and luminescent material of known available is U.S. Patent No. 4,768,292, 1 - 5141671, 1 - 5,150,006 No., 5,151,629 No., 5,294,870, No. 5,405,709, 1 - 5484922, 1 - 5593788, 1 - 5645948, 1 - 5,683,823 , 1 - No. 5,755,999, No. 5,928,802, 1 - 5.93572 million, 1 - No. 5,935,721 and include, but the compounds described in No. 6,020,078, are not limited. 8-하이드록시퀴놀린 및 유사 유도체의 금속 복합체(하기 화학식 E)는 전기발광, 특히 500nm 보다 긴 파장의 발광, 예를 들어 녹색, 황색, 오렌지색 및 적색 발광에 적합한 한 부류의 유용한 호스트 물질을 구성한다. 8-hydroxyquinoline and metal complexes of similar derivatives (Formula E) constitute the electroluminescence, as long as light emission of a wavelength greater than 500nm, for example, a class of useful host materials suitable for green, yellow, orange, and red light-emitting . Z는 각각의 경우에 독립적으로 둘 이상의 융합된 방향족 고리를 갖는 핵을 완성하는 원자이다. Z is the atoms completing a nucleus having at least two fused aromatic rings, independently for each occurrence. 상기로부터, 금속이 1가, 2가 또는 3가 금속일 수 있음은 자명하다. That the metal is one from above, be a bivalent or trivalent metal is evident. 금속의 예로는 리튬, 나트륨 또는 칼륨과 같은 알칼리 금속; Examples of the metal include alkali metals such as lithium, sodium or potassium; 마그네슘 또는 칼슘과 같은 알칼리 토금속; Alkaline earth metals such as magnesium or calcium; 또는 붕소 또는 알루미늄과 같은 토금속일 수 있다. Or it may be an earth metal, such as boron or aluminum. 킬레이트화 금속으로서 공지된 통상의 1가, 2가 또는 3가 금속이 사용될 수 있다. Of it is known normal as chelated metal is 1, a divalent or trivalent metal can be used. Z는 둘 이상의 융합된 고리를 함유하는 헤테로고리 핵을 완성하며, 상기 둘 이상의 융합된 고리 중 하나 이상은 아졸 또는 아진 고리이다. Z is complete a heterocyclic nucleus containing at least two fused rings, and one or more of the fused rings is an at least two azole or azine ring. 필요한 경우, 지방족 및 방향족 고리 모두를 포함하는 추가의 고리들이 상기 2개의 필요수 고리와 융합될 수 있다. If desired, additional rings, including both aliphatic and aromatic rings may be fused with the two required rings can. 작용을 개선시키는 기능 없이 분자가 거대화되는 것을 피하기 위해, 고리 원자들의 수는 18개 이하로 유지되는 것이 일반적이다. In order to avoid that the molecule is geodaehwa no function of improving the action, the number of ring atoms is usually maintained at 18 or less. 발광층(150)의 호스트 물질은 9 및 10 위치에서 탄화수소 또는 치환된 탄화수소 치환체를 갖는 안트라센 유도체일 수 있다. The host material of the light-emitting layer 150 may be an anthracene derivative having hydrocarbon or substituted hydrocarbon substituents at the 9 and 10 position. 예를 들어, 9,10-다이-(2-나프틸)안트라센의 유도체가 전기발광, 특히 400nm 보다 긴 파장의 발광, 예를 들어 청색, 녹색, 황색, 오렌지색 및 적색 발광에 적합한 한 부류의 유용한 호스트 물질을 구성한다. For example, 9,10-di- (2-naphthyl) The electroluminescence anthracene derivatives, especially light emission of wavelengths longer than 400nm, for example, blue, green, yellow, orange, and useful in a class of suitable red light emitting configure the host material. 벤즈아졸 유도체는 전기발광, 특히 400nm 보다 긴 파장의 발광, 예를 들어 청색, 녹색, 황색, 오렌지색 및 적색 발광에 적합한 또다른 부류의 유용한 호스트 물질을 구성한다. Benzamide azole derivatives constitute the electroluminescence, especially light emission of wavelengths longer than 400nm, for example, another class of useful host materials suitable for the blue, green, yellow, orange, and red emission. 유용한 벤즈아졸의 한 예는 2,2',2"-(1,3,5-페닐렌)트라이스[1-페닐-1H-벤즈이미다졸]이다. An example of a useful triazole is a dibenz 2,2 ', 2 "- is a (1,3,5-phenylene) tris [1-phenyl -1H- benzimidazole. 바람직한 형광 도펀트로는 퍼릴렌(perylene) 또는 퍼릴렌의 유도체, 안트라센의 유도체, 테트라센, 잔텐, 루브렌, 쿠마린, 로다민, 퀴나크리돈, 다이시아노메틸렌피란 화합물, 싸이오피란 화합물, 폴리메틴 화합물, 파이릴륨(pyrilium) 및 싸 이아파이릴륨 화합물, 다이스티릴벤젠 또는 다이스티릴바이페닐의 유도체, 비스(아지닐)메탄 보론 착체 화합물, 및 카보스티릴 화합물이 포함된다. Preferred fluorescent dopants include perylene (perylene) or derivatives of perylene, anthracene derivatives, tetracene, xanthene, rubrene, coumarin, rhodamine, quinacridone,-dicyano methylene pyran compound, Im op is the compound, poly methine include compounds, pie rilryum (pyrilium) and wrapped Iain pie rilryum compound, di-styryl benzene or di-derivatives, bis styryl biphenyl (azinyl) methane boron complex compounds, and carbonyl styryl compound. 기타 유기 발광 물질은 중합성 물질, 예를 들어 폴리페닐렌비닐렌 유도체, 다이알콕시-폴리페닐렌비닐렌, 폴리-파라-페닐렌 유도체 및 폴리플루오렌 유도체일 수 있으며, 이들 화합물은 울크(Wolk) 등에 의해 공동 양도되고 본원 참고문헌으로서 인용되는 미국 특허 제6,194,119 B1호에 개시되어 있다. Other organic light emitting materials are polymeric materials, for example, polyphenylene vinylene derivatives, di-alkoxy-poly-phenylenevinylene, poly-para-may be a phenylene derivatives, and polyfluorene derivatives, these compounds ulkeu (Wolk ) and commonly assigned or the like, it is disclosed in U.S. Patent No. 6,194,119 B1, which is incorporated as a call reference herein. 항상 필요하지는 않을지라도, OLED 장치(110)는 발광층(150) 위에 배치되는 전자 수송층(155)을 포함하는 것이 종종 유용하다. Although not always required, OLED device 110 it is often useful to include an electron transport layer 155 disposed over light-emitting layer 150. 바람직한 전자 수송 물질은 증발, 스퍼터링, 화학증착, 전기화학적 수단, 열전달 또는 레이저 열전달과 같은 적합한 방식에 의해 도너 물질로부터 증착되거나, 본원에 기술된 장치 및 방법에 의해 증착될 수 있다. A preferred electron transport material or deposited from the donor material by a suitable method such as evaporation, sputtering, chemical vapor deposition, electrochemical means, thermal heat transfer, or laser, may be deposited by the device and method described herein. 전자 수송층(155)에 사용하기에 바람직한 전자 수송 물질은 옥신 자체(8-퀴놀리놀 또는 8-하이드록시퀴놀린이라고도 함)의 킬레이트를 포함하는 금속 킬레이트화된 옥시노이드 화합물이다. Preferred electron transporting materials for use in electron-transporting layer 155 is a self-oxine (8-quinolinol or 8-hydroxyquinoline also referred to as) a metal chelate comprising a chelated oxinoid compound. 상기 화합물들은 전자를 주입하고 수송하는 것을 도와, 이러한 작용 모두에 있어서 고수준의 성능을 나타내며, 얇은 박막 형태로 용이하게 제조된다. The compounds help to inject and transport electron, in both these action indicates a high level of performance, and is easily produced into thin films form. 옥시노이드 화합물의 예로는 상술한 바 있는 화학식 E를 만족하는 화합물이 고려된다. Examples of oxinoid compounds is considered a compound which satisfies the formula (E) in the above description. 다른 전자 수송 물질로는 미국 특허 제4,356,429호 개시된 바와 같은 다양한 부타디엔 유도체, 및 미국 특허 제4,539,507호에 개시된 바와 같은 다양한 헤테로고리 광학 브라이트너(brightener)가 포함된다. With other electron transporting materials include various heterocyclic optical Brightener (brightener), as disclosed in the various butadiene derivatives, and United States Patent 4,539,507 as U.S. Patent No. 4,356,429 disclosed. 화학식 G를 만족하는 벤즈아졸이 또한 전자 수송 물질로서 유용하다. The benzamide azole satisfying Formula G are also useful as the electron transport material. 다른 전자 수송 물질은 중합체성 물질, 예를 들어 폴리페닐렌비닐렌 유도체, 폴리-파라-페닐렌 유도체, 폴리플루오렌 유도체, 폴리싸이오펜, 폴리아세틸렌 및 기타 전도성의 중합체성 유기 물질일 수 있으며, 이들 화합물은 문헌[ Handbook of Conductive Molecules and Polymers , Vols. Other electron-transporting materials are polymeric materials, such as a polyphenylene vinylene derivative, poly-may be a polyphenylene derivative, a polyfluorene derivative, a polythiophene, a polymeric organic material of polyacetylene, and other conductive, para these compounds are described in [Handbook of Conductive Molecules and Polymers, Vols. 1-4, HS Nalwa, ed., John Wiley and Sons, Chichester (1997)]에 개시되어 있다. 1-4, there is disclosed the HS Nalwa, ed., John Wiley and Sons, Chichester (1997)]. 전자 주입층(160)이 또한 음전극과 전자 수송층 사이에 존재할 수 있다. The electron injection layer 160 may also be present between the cathode electrode and the electron transport layer. 전자 주입 물질의 예로는 알칼리 금속 또는 알칼리 토금속, 상기 언급된 LiF와 같은 알칼리 할라이드 염, 또는 알칼리 금속이나 알칼리 토금속이 도핑된 유기층이 포함될 수 있다. Examples of electron-injecting materials may be included the alkali halide salt, or an alkali metal or alkaline earth metal, such as alkali metal or alkaline earth metal, the above-mentioned LiF doped organic layer. 전자 수송층(155) 위에, 또는 전자 수송층이 사용되는 않는 경우에는 발광층 위에 음전극(190)이 형성된다. If on the electron transport layer 155, or the electron transport layer that is used, the negative electrode 190 is formed on the light emitting layer. 발광이 양전극(130)을 통해 이루어지는 경우, 양전극 재질은 거의 모든 전도성 물질로 구성될 수 있다. When light emission is made through the positive electrode 130, a positive electrode material may be configured into nearly any conductive material. 바람직한 물질은 제막 특성이 우수하여 하부 유기층과의 접촉성이 우수하고, 낮은 전압에서 전자 주입을 촉진하며, 안정성이 우수하다. A preferred material is excellent in film-forming properties, and the contact between the solid and the lower organic layer, promote electron injection at low voltage, and is excellent in stability. 유용한 양전극 재질은 종종 낮은 일 함수 금속(<3.0eV) 또는 금속 합금을 함유한다. Useful positive electrode materials often contain a low work function metal (<3.0eV) or metal alloy. 한 가지 바람직한 양전극 재질은 미국 특허 제4,885,221호에 개시된 바와 같은 Mg:Ag의 합금(여기에서, 은의 비율은 1 내지 20% 범위임)으로 구성된다. One preferred material is a positive electrode Mg, as disclosed in U.S. Patent No. 4,885,221: Ag alloy consists of (where the silver ratio is 1 to 20% of Im). 또 다른 적합한 부류의 양전극 재질은 낮은 일 함수 금속 또는 금속염의 얇은 층과, 이를 덮고 있는 전도성 금속의 두꺼운 층으로 구성된 이중층을 포함한다. In the positive electrode material of the other suitable class comprises a double layer consisting of a thicker layer of conductive metal covering this thin layer of low work function metal or metal salt and,. 그러한 양전극의 한 가지 예는 미국 특허 제5,677,572호에 개시된 바와 같이, LiF의 얇은 층과 이어지는 Al의 두꺼운 층으로 구성된다. One example of such positive electrode is of a thick layer of Al, it followed with a thin layer of LiF as disclosed in U.S. Patent No. 5,677,572. 다른 유 용한 양전극 재질로는 미국 특허 제5,059,861호, 제5,059,862호 및 제6,140,763호에 기술된 예들이 포함되나, 이에 국한되는 것은 아니다. But in other useful positive electrode material comprises the example are described in U.S. Patent No. 5,059,861, No. 5,059,862 and No. 6,140,763 arc, but is not limited to this. 발광이 음전극(190)을 통해 보이는 경우, 음전극은 투명하거나 거의 투명해야 한다. When light emission is viewed through the cathode 190, the cathode electrode is transparent or to be nearly transparent. 이러한 경우에는, 금속은 얇아야 하거나, 투명한 전도성 산화물을 사용하거나 이들 물질을 포함해야 한다. In such a case, the metal is thin, must, or must use transparent conductive oxides, or include these materials. 광학적으로 투명한 음전극에 대해서는 미국 특허 제5,776,623호에 보다 상세하게 기술되어 있다. For the optically transparent negative electrode it is in detail described in U.S. Patent No. 5,776,623. 음전극 재질은 증발, 스퍼터링 또는 화학증착에 의해 증착될 수 있다. A negative electrode material may be deposited by evaporation, sputtering or chemical vapor deposition. 필요한 경우, 패터닝이, 쓰루우-마스크(through-mask) 증착, 미국 특허 제5,276,380호 및 EP 제0 732 868호에 기술된 집적 섀도우 마스킹, 레이저 박리 및 선택적 화학증착(이에 국한되지 않음)을 비롯한 다양한 널리 공지된 방법들을 통해 수행될 수 있다. If needed, patterning, through the right-mask (through-mask) deposition, U.S. Patent No. 5.27638 million and EP-0 732 integrated shadow technology to 868 No. masking, laser ablation, and selective chemical vapor deposition but not limited to, including It can be carried out through a variety of well-known methods. 음전극 재질은 증발, 스퍼터링 또는 화학증착에 의해 증착될 수 있다. A negative electrode material may be deposited by evaporation, sputtering or chemical vapor deposition. 필요한 경우, 패터닝이, 쓰루우-마스크(through-mask) 증착, 미국 특허 제5,276,380호 및 EP 제0 732 868호에 기술된 집적 섀도우 마스킹, 레이저 박리 및 선택적 화학증착(이에 국한되지 않음)을 비롯한 다양한 널리 공지된 방법들을 통해 수행될 수 있다.. If needed, patterning, through the right-mask (through-mask) deposition, U.S. Patent No. 5.27638 million and EP-0 732 integrated shadow technology to 868 No. masking, laser ablation, and selective chemical vapor deposition but not limited to, including It can be carried out through a variety of well-known methods. 본 발명은 특정의 바람직한 구체예를 참조하여 상세하게 설명되었으나, 이의 변형 및 수정이 본 발명의 사상 및 범위내에서 이루어질 수 있음을 주지하여야 한다. The invention shall be noted that although described in detail with reference to certain preferred embodiments, the variations thereof and modifications may be made within the spirit and scope of the invention. d) 유기물질을, 상기 제2 가열 영역에 체류하는 유기물질이 원하는 기화율-의존성 기화온도에서 가열되도록 제어된 속도로 제 1 가열영역에서 제 2 가열영역으로 미터링(metering)하여, 유기물질을 기판 표면상에서 승화시켜 박막을 형성하는 단계를 포함하는, 기판 표면상에 유기물질을 기화시켜 박막을 형성하는 방법. d) an organic material, the second heating zone the organic material desired vaporization rate to stay in the - by metering (metering) in the first heating zone at a controlled rate so that the heat from the dependent vaporization temperature in a second heating zone, the organics by sublimation from the substrate surface to vaporize the organic material on the substrate surface and forming a thin film method of forming a thin film. 상기 유기물질이, 기화율에 따라 선형적으로 변화하는 제어된 속도로 투과성 부재를 통해 제 2 가열영역으로 미터링되는 것을 특징으로 하는 박막을 형성하는 방법. To the organic substance, forming the thin film, characterized in that metering the second heating zone through the permeable member at a controlled rate to change linearly in accordance with the vaporization rate. 증착 챔버를 제공하고 기화를 차단함으로써 기판 표면을 코팅하지 않을 때 상기 증착 챔버벽의 오염을 최소화하고 상기 유기물질을 보호하는 단계를 추가로 포함하는 것을 특징으로 하는 박막을 형성하는 방법. A method of providing a deposition chamber and minimize the contamination of the deposition chamber wall when not coating the surface of the substrate by blocking the evaporation and form a thin film, characterized in that further comprising the step of protecting the organic material. 상기 유기물질의 일정한 부피가 상기 제 2 가열영역에서 유지되어 일정한 플룸(plume) 모양을 형성하고 유지하는 것을 특징으로 하는 박막을 형성하는 방법. A method of forming a thin film, characterized in that the constant volume of the organic material is maintained in the second heating zone to form and maintain a constant plume (plume) shape. 상기 제 1 가열영역이 상기 유기물질의 소모에 따라 일정한 가열 온도로 유지되는 것을 특징으로 하는 박막을 형성하는 방법. To the first heating zone to form a thin film, characterized in that is held at a constant heating temperature in accordance with the consumption of the organic material. 상기 제 2 가열영역이 상기 유기물질의 소모에 따라 일정한 가열 온도로 유지되는 것을 특징으로 하는 박막을 형성하는 방법. Method for the second heating zone to form a thin film, characterized in that is held at a constant heating temperature in accordance with the consumption of the organic material. 상기 제 1 가열영역에 상기 냉각 베이스 블록과 유기물질 사이에 액체를 제공하여, 상기 유기물질과 상기 베이스 냉각 블록 사이를 상기 액체를 통해 열 접촉시키고 밀폐되게 실링하는 단계를 추가로 포함하는 것을 특징으로 하는 박막을 형성하는 방법. Providing a liquid between the cooling base block and the organic material in the first heating zone, it characterized in that it comprises between the organic material and the base cooling block the further step of thermal contact and sealed to be sealing with the liquid a method of forming a thin film. 상기 유기물질이, 기화율에 따라 선형적으로 변화하는 제어된 속도로 제 2 가열영역내의 회전 드럼 표면에 미터링되는 것을 특징으로 하는 박막을 형성하는 방법. Method in which the organic material, form a thin film, characterized in that the metering surface in the rotary drum in the second heating region at a controlled rate to change linearly in accordance with the vaporization rate. d) 유기물질을, 상기 제2 가열 영역에 체류하는 유기물질이 원하는 기화율-의존성 기화온도에서 가열되도록 제어된 속도로 제 1 가열영역에서 제 2 가열영역으로 미터링하여, 유기물질의 각 성분을 동시에 기화시켜 기판 표면에 박막을 형성하는 단계를 포함하는, 기판 표면에 유기물질을 기화시켜 박막을 형성하는 방법. d) the organic material, wherein the group of the organic material to stay in the second heating zone the desired ratio - to Metering dependence in the first heating zone at a controlled rate so that the heat from the gasification temperature in the second heating zone, the components of the organic material vaporizing at the same time forming a thin film on the substrate surface, the vaporized organic material to the substrate surface, a method of forming a thin film. 상기 유기물질이, 기화율에 따라 선형적으로 변화하는 제어된 속도로 투과성 부재를 통해 상기 제 2 가열영역으로 미터링되는 것을 특징으로 하는 박막을 형성하는 방법. Method in which the organic material, form a thin film, characterized in that the metering in the second heating zone through the permeable member at a controlled rate to change linearly in accordance with the vaporization rate. 증착 챔버를 제공하고 기화를 차단함으로써 상기 기판 표면을 코팅하지 않을 때 증착 챔버벽의 오염을 최소화하고 상기 유기물질을 보호하는 단계를 추가로 포함하는 것을 특징으로 하는 박막을 형성하는 방법. A method of providing a deposition chamber, and by blocking the evaporation minimizing contamination of the deposition chamber wall when not coating the substrate surface and form a thin film, characterized in that further comprising the step of protecting the organic material. 상기 유기물질의 일정한 부피가 상기 제 2 가열영역에서 유지되어 일정한 플룸 모양을 형성하고 유지하는 것을 특징으로 하는 박막을 형성하는 방법. A method of forming a thin film, characterized in that the constant volume of the organic material is maintained in the second heating zone to form and maintain a constant plume shape. 제 1 가열영역이 유기물질의 소모에 따라 일정한 가열 온도로 유지되는 것을 특징으로 하는 박막을 형성하는 방법. First method of this heating zone to form a thin film, characterized in that is held at a constant heating temperature in accordance with the consumption of organic matter. 상기 제 1 가열영역에 상기 유기물질을 둘러싸는 냉각 베이스 블록, 및 상기 냉각 블록과 상기 유기물질 사이에 액체를 제공하여, 상기 액체를 통해 상기 유기물질과 베이스 블록 사이를 열 접촉시키고 및 밀폐되게 실링하는 단계를 추가로 포함하는 것을 특징으로 하는 박막을 형성하는 방법. The first provides a liquid between the enclosing the organic material is a cooling base block, and said cooling block and the organic material in the heating zone, and the thermal contact between the organic material and the base block via the fluid and be sealed the sealing method to form a thin film, characterized in comprising additionally. 상기 투과성 부재는 상기 제1 및 제2 가열 영역 사이에 메쉬 스크린 형태로형성되며, 상기 유기물질과 접촉하는 것을 특징으로 하는 박막을 형성하는 장치. The permeable member is a device for forming a thin film, characterized in that formed in the first and second mesh screen between the heating zone forms, in contact with the organic material. 상기 제 1 가열수단은 제어 통로, 및 상기 제어 통로를 통해 유체를 펌핑하여 상기 유체가 상기 제 1 가열영역으로부터 열을 흡수하거나 이에 열을 전달하게 하는 수단을 포함하는 것을 특징으로 하는 박막을 형성하는 장치. It said first heating means to form a thin film which is characterized in that it comprises means for causing the fluid to absorb heat, or transfer heat thereto from the first heating region to pump the fluid through a control passage, and the control passage Device. 상기 미터링 수단은 상기 유기물질을 수용하기 위한 챔버 및 상기 챔버에서 상기 유기물질을 밀어올리기 위한 피스톤을 포함하는 것을 특징으로 하는 박막을 형성하는 장치. The metering means includes apparatus for forming a thin film comprising the piston to boost the organic material in the chamber and the chamber for accommodating the organic substances. 상기 제 1 가열수단은 상기 제 1 가열영역에서 상기 유기물질을 둘러싸고 있는 냉각 베이스 블록, 및 상기 냉각 베이스 블록과 상기 유기물질 사이에 액체를 포함하며, 상기 액체가 상기 유기물질과 상기 냉각 베이스 블록 사이의 열접촉 및 밀폐되게 실링을 제공하는 것을 특징으로 하는 박막을 형성하는 장치. Wherein between the first heating means is the first annealing surrounding the organic material in the area base block, and the cooling base block and comprising a liquid between the organic material and the liquid is the organic material and the cooling base block the thermal contact and to be an apparatus for forming a thin film, characterized in that to provide a seal closed. 상기 미터링 수단은 상기 유기물질을 기화율에 따라 선형적으로 변화하는 제어된 속도로 상기 제 2 가열영역으로 미터링하는 것을 특징으로 하는 박막을 형성하는 장치. The metering means includes apparatus for forming a thin film, characterized in that for metering into the second heating region at a controlled rate to change linearly in accordance with the vaporization rate of the organic material. 상기 기판을 둘러싸고 있고 기화된 상기 유기물질을 수용하기 위한 증착 챔버를 추가로 포함하고, 상기 제 2 가열수단이 가열을 중단하기 위한 수단을 포함함으로써, 온도를 하나 이상의 유기 성분의 기화 온도 미만으로 떨어뜨려 상기 기판을 코팅하지 않을 때 증착 챔버벽의 오염을 감소하고 유기물질을 보호하는 것을 특징으로 하는 박막을 형성하는 장치. Surrounding the substrate, and further comprising a deposition chamber for receiving vaporized the organic material, and by including the second heating means is a means to stop the heating, drops the temperature below the vaporization temperature of the at least one organic component disappointed apparatus for reducing contamination of the deposition chamber wall when not coating the substrate to form a thin film, characterized in that to protect the organic materials. 상기 미터링 수단은 상기 제 2 가열영역에서 상기 유기물질의 일정한 부피를 유지함으로써 일정한 플룸(plume) 모양을 형성하고 유지하는 것을 특징으로 하는 박막을 형성하는 장치. The metering means includes apparatus for forming a thin film as to form and maintain a constant plume (plume) shape by maintaining a constant volume of the organic material in the second heating zone. 상기 제 1 가열영역은 상기 유기물질의 소모에 따라 일정한 가열 온도로 유지되는 것을 특징으로 하는 박막을 형성하는 장치. Wherein the first region is heated to form a thin film, characterized in that is held at a constant heating temperature in accordance with the consumption of the organic material.